countryside past farms and old log cabins, through meadows and up the mountain for some amazing views. gear to our creek-side camping outpost. While we set up camp our non-riders can take a hike or relax by the creek. fire in an easy chair and enjoy mountain music with a local musician. Toast some marshmallows and Angels on Horseback. and drift to sleep to the sound of the creek. our non-riders will meet you back at the stable. 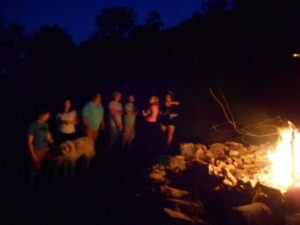 We’ll all swap stories and you’ll take home memories that will last forever. We provide all the equipment and we do all the setup– just bring your personal items. Our creekside camp is set up with a cook tent and dining tent, big stone fire rings, pioneer games, and easy chairs. 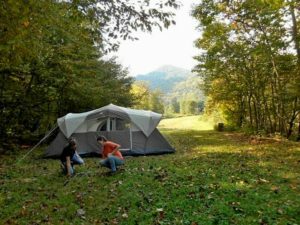 You’ll camp in comfort with spacious lighted tents, cots with sleeping bags and pillows, enclosed port-a- potty and running water. 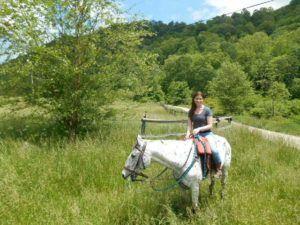 Your horses will be pastured nearby and you’re welcome to lend a hand with grooming, feeding, and tacking up. Children under 5: Free. Must be accompanied by an adult non-rider. Minimum of 2 riders. Maximum of 6 riders. Non-riders only accepted when accompanied by 2 riders. Accommodation for up to 10 non-riders. Children are welcome. Any skill level of rider is welcome, including first time riders. Minimum age to ride is 7. Rider weight limit is 240 pounds. Departures on Saturdays, Tuesdays, and Thursdays. due to weather, participants will receive full credit for a future trip. 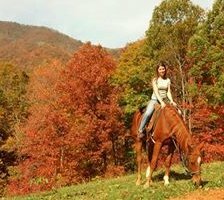 Call 828-683- 5758 for availability and booking.